More and More Treatments: Are We There Yet? New treatments—from cannabinoids to deep brain stimulation—may help meet the needs of still too many patients with uncontrolled seizures. Over the past several years, there have been many advances in the diagnosis and treatment of epilepsy. New antiepileptic medications have been approved, and several other promising agents are in the clinical-trials pipeline. New surgical techniques target specific foci, within the brain or extracranially, and provide more treatment options for patients with epilepsy. Unfortunately, despite this progress, seizures remain uncontrolled in approximately 30% of patients. Recent developments introduce additional therapeutic options, allowing better treatment tolerability and seizure reduction for many. In this update, we review these recent advances in several different key areas of epilepsy. Every year, new epilepsy genes are identified, and the field of genetic testing is expanding rapidly. 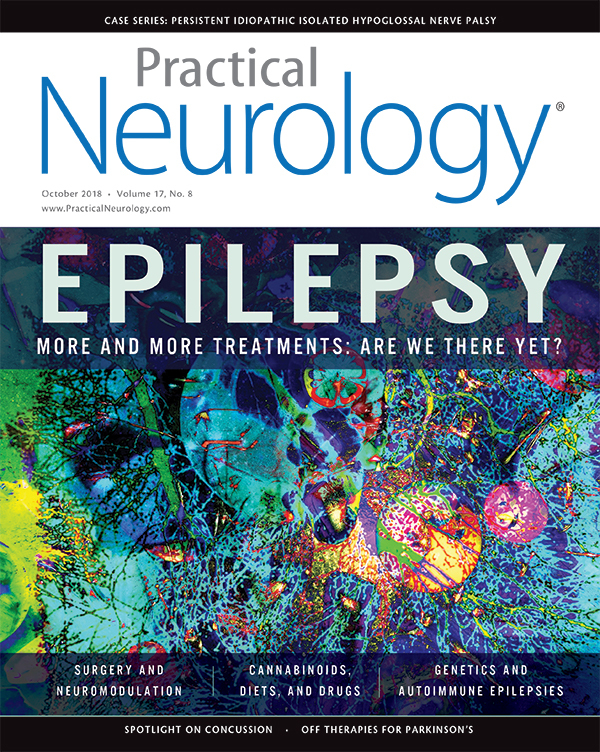 Dr. Alica Goldman provides a much-needed review on the types of genetic testing available for people with epilepsy and a practical guide on the selection of the proper testing in various clinical scenarios. Autoimmune epilepsy is another rapidly developing field. Although no randomized controlled trials exist to guide treatment precisely, accumulating data help the clinician more readily identify and diagnose these conditions. Dr. Lindsay Higdon reviews recent findings, diagnostic testing modalities, and treatment options. While new conditions are increasingly identified, it is also important to readily recognize more common epilepsy syndromes. Drs. Barua and Anilkumar review key features of some childhood focal-epilepsy syndromes. Antiepileptic medication treatment remains the mainstay for most patients with epilepsy. Drs. Doyle and Alick provide an overview of medication options, including useful reference tables summarizing specific drug properties. Frances Knapp and Dr. Alison Pack review the special concerns of antiepileptic medication use during pregnancy and provide an overview of care of women during the preconception, pregnancy, and postpartum periods. Many patients are now eagerly asking their neurologists about cannabanoids for epilepsy. As Drs. Turner and Perry note in their review, cannabanoids have been used for medicinal purposes for centuries, but only recently have clinical trials been performed and data generated supporting its use in treating people with epilepsy. Epilepsy surgery is an effective option for patients with refractory epilepsy, providing a high likelihood of seizure freedom in appropriate surgical candidates. Dr. Joon Kang reviews surgical management of intractable epilepsy and provides an overview of surgical resection and newer minimally invasive techniques. Dr. Ahmad Soltani, Isha Sharan, and Dr. Ashwini Sharan review neurostimulation techniques, including clinical-trial outcomes for open- and closed-loop neurostimulation devices and the clinical scenarios in which a specific device may be considered. Another important option is dietary treatment. Dr. Christina Bergqvist reviews the pros and cons of the classic ketogenic diet, modified Atkins, and other dietary regimens. These provide attractive options for many and are effective in both children and adults with epilepsy. Most patients will respond to medication treatment. However, for patients whose seizures continue despite medication, providing a definitive diagnosis and correct epilepsy classification leads to specific treatment options. Early recognition and referral of patients with refractory epilepsy to an epilepsy specialist for evaluation and possible epilepsy surgery or other options is important. Appropriate therapy can reduce the risk of potential long-term adverse outcomes, injury, and death related to epilepsy and can improve quality of life.